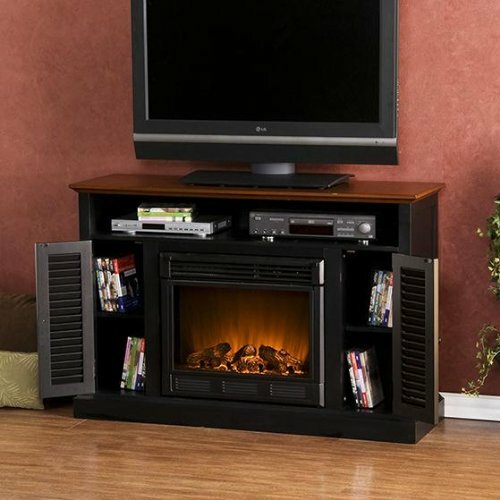 Classic cottage styling, two-tone black and walnut finish and multipurpose functionality make this exquisite fireplace media stand a no brainer. 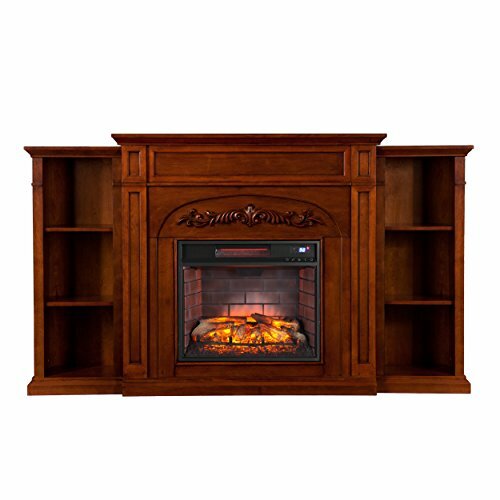 Louvered cabinet doors on each and every side of the firebox house an adjustable shelf for numerous media storage. 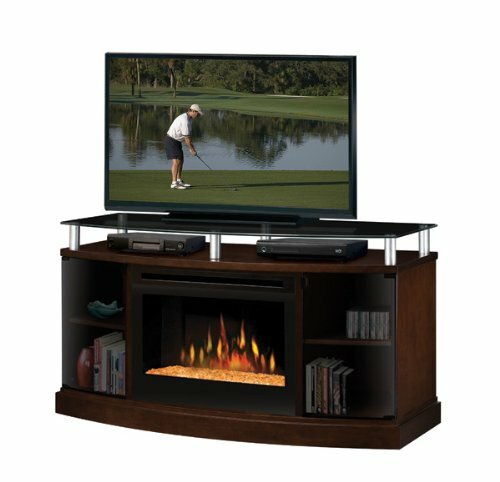 A big open shelf boasts space for receivers and game consoles complete with two openings for cord management. Combine with up to a 50-Inch flat screen TV and any room in your house will turn out to be the favorite. 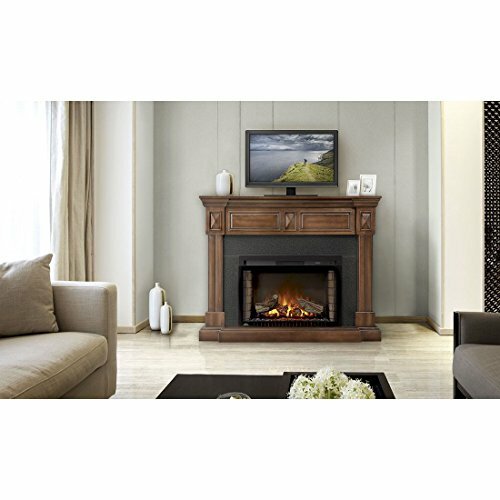 Portability and ease of assembly are just two of the reasons why our fireplace mantels are ideal for your home. Requiring no electrician or contractor for installation allows instant remodeling without the standard mess or expense. 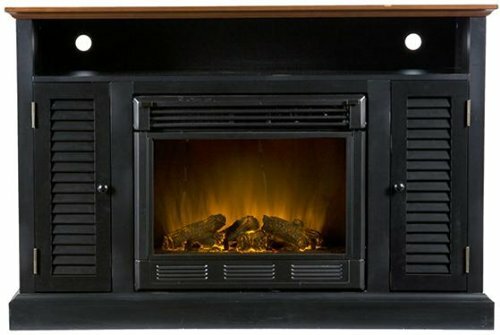 Use this great functional fireplace to make your home a more welcoming environment. 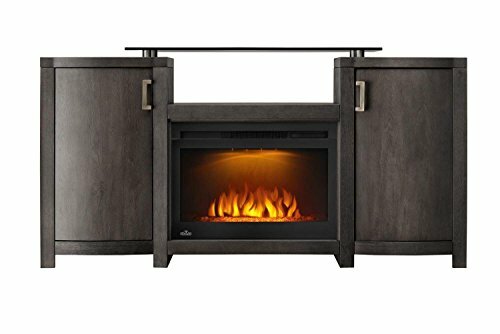 48-Inch W by 15-Inch D by 32-Inch H; Two Side Cabinets – 7-1/2-Inch W by 12-Inch D by 21-Inch H; Open Shelf – 43-Inch W by 14-Inch D by 5-1/2-Inch H; Ideal for up to 50-Inch flat screen Tv; Two-Tone Black and Walnut Finish; 1 Adjustable shelf in each and every cabinet; Perfect for any room; Beautiful media room accent; Mantel supports up to 85-pound; Wood and paint is distressed with small wormholes and imperfections to add character; Firebox front – 23-Inch Wide by 20-Inch Tall; Remote keep watch over (2 AAA Batteries Required); Realistic flickering flame effect; Long life LED light; 120-volt-60Hz, 1500-Watt / 5000 BTUs, 12.5 Amp; Easy to make use of adjustable thermostat; Safety thermal overload protector; Adjustable flame brightness keep watch over; Plugs into standard wall outlet; Tested to heat 1500-cubic feet in only 24-minute (14-feet by 14-feet by 8-feet); Uses about the same energy as a coffee maker; 100-percent energy efficient with low operating costs; Produces zero emissions or pollutants; Eco friendly, consuming no wood or fossil fuels; No combustion, glass remains cool to the touch.